Regional growth in the European Union hinges to a large extent on smart specialization, a new and exciting theme in economic innovation studies. 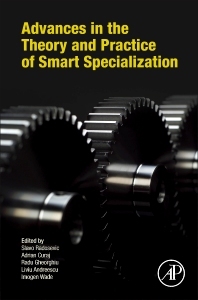 Advances in the Theory and Practice of Smart Specialization illuminates problems that have stifled the implementation of smart specialization policies, such as unique regional constraints and the inter-dependent demands of economic growth and commercial development. Forward-looking and pragmatic, it provides guidance for developing smart specialization strategies both to those involved in European affairs and others grappling with regional innovation and economic development worldwide. Slavo Radošević is Acting Director and Professor of Industry and Innovation Studies at University College London’s School of Slavonic and Eastern European Studies. His research is concentrated in the area of the economics of technological change and innovation studies, particularly issues of growth and structural change through innovation systems, entrepreneurship, international business and innovation policy perspectives. He is the author of numerous articles in these fields as well as the co-editor of several books, including, among others, "The Knowledge-based Economy in Central and Eastern Europe: Countries and Industries in a Process of Change" (Palgrave Macmillan, 2006). Adrian Curaj ia a Professor at Politehnica University of Bucharest, and the holder of the UNESCO Chair on Science and Innovation Policies at the National School of Political Studies and Public Administration. Prof. Curaj is a former Minister of Education, Science and Innovation (2015-2016). He served as the General Director of the Executive Agency for the Funding of Higher Education, Scientific Research, Development and Innovation (2011-2015) and as the President of the National Authority of Scientific Research (2009-2010). Adrian Curaj has experience in designing and managing science & innovation and higher education policies. Prof. Curaj is the co-editor, among others, of Mergers and Alliances in Higher Education: International Practice and Emerging Opportunities (Springer, 2014), Mergers and Alliances in Higher Education (Springer, 2014), Higher Education Reforms in Romania – Between the Bologna Process and National Challenges (Springer, 2014), European Higher Education at the Crossroads: Between the Bologna Process and National Reforms (Springer, 2012). Radu Gheorghiu is Senior Researcher with the Romanian Academy’s Institute of World Economy in Bucharest. Over the past decade he been designing and implementing forward-looking strategic projects in the fields of science and innovation, higher education, and public administration. Dr. Gheorghiu has built and managed large participatory online consultation tools and is the author of several methodological contributions to foresight, scenario-building, and Delphi consultation. He is the current ERAWATCH national expert for Romania and the author of its annual Analytical Country Report.